Goo Goo Dolls News & Info / NYC Beacon Theatre 10/15/18: post your photos and videos here! Thanks to the AG crew! 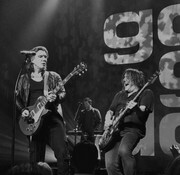 New York - On October 15, acclaimed pop-rock group, Goo Goo Dolls, headlined Beacon Theatre in New York City, as part of the 20th anniversary tour of "Dizzy Up The Girl." 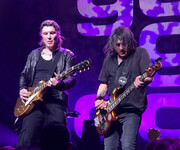 For the first half of their show, the Goo Goo Dolls (comprised of John Rzeznik and Robby Takac) performed their seminal album, Dizzy Up The Girl, from start to finish, as the album's cover art graced the Beacon Theatre stage as a backdrop. The Goo Goo Dolls kicked off their set with "Dizzy," and they immediately broke into their popular hit "Slide," prior to taking their fans on a trip to "Broadway," which was quite infectious. The inclusion of the Takac-penned "January Friend" was an added bonus, and it was a beautiful sight to see fans bounce small "black balloons" throughout the venue during "Black Balloon." "Thank you very much," Rzeznik said, graciously. They continued with other noteworthy tunes as "Bullet Proof," "Amigone," "All Eyes on Me," "Full Forever," as well as "Acoustic No. 3," the latter of which ought to be enjoyed for its beauty and simplicity. Their live rendition of their endearing classic "Iris" was spectacular, and after "Extra Pale," they sang the mid-tempo "Hate This Place," which is the song that Rzeznik claimed as his personal favorite on the Dizzy Up The Girl album, and rightfully so. Following their Dizzy Up The Girl album, the Goo Goo Dolls went on to play some impressive deep cuts. Rzeznik tried something different where he sang "Better Days" with a video in the background of him playing the acoustic guitar, and for the follow-up "Can't Let It Go," he switched it up by performing the acoustic guitar, with a video in the background of him singing the song. Both band members were featured in the video for "Two Days in February." Other highlights included their smash hit "Name," as well as the bluesy and sultry "So Alive," and their melodically-stunning "Notbroken." If 24 songs weren't enough, Rzeznik and Takac returned for a two-song encore, which included their vivacious "Big Machine" and "Flat Top." Overall, the Goo Goo Dolls were phenomenal at the Beacon Theatre, as part of the 20th anniversary tour of their landmark album, Dizzy Up The Girl. They sang and played with a great deal of heart and charisma. They had their New York fans with them every step of the way. Rzeznik proves that he is one of the most compelling singer-songwriters of our time, and Takac proved to be "all about that bass," to quote the title of the Meghan Trainor tune. This is a rock band that deserves to someday be nominated for the Rock and Roll Hall of Fame. For anybody who has any doubts, all they need to see is a highlight reel of the Goo Goo Dolls' Beacon Theatre show. Their live set at the Beacon Theatre garnered five out of five stars.